Melissa Ray has by no means lived a conventional life. A Muay Thai fighter that has traveled the world, fought on televised bouts, and now currently resides in Thailand, it's safe to assume that she follows her gut and knows what's best for herself. The English competitor has achieved what many Nak Muays have only dreamed of: not only fighting on the Queen and King birthdays, which are national holidays in Thailand, but also winning 4 world titles. Ray finished her career with 41 professional and 8 amateur bouts, but still trains near-daily in the same gym she's been in for the last 9 years: Eminent Air Boxing Gym. 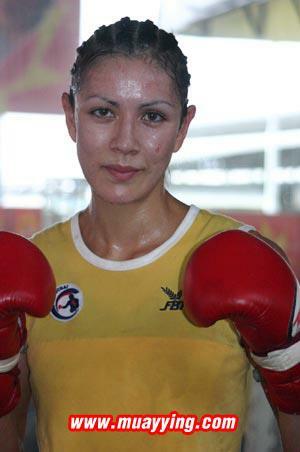 Ray is one of the most well-known female Muay Thai fighters, with a plethora of articles and interviewswrittenabouther. A world champion with a doctorate in neuroscience, Melissa illustrates that sport and academics are not as separated as many would like to believe. Neuroscience, the study of the brain, and Muay Thai, often referred to as the science of 8 limbs, exemplifies Ray as an expert in both fields, due to her vast expertise and knowledge of the sport. A self-described "fanatic", she now manages her website Muay Thai on the Brain to share her familiarity of Muay Thai, as well as events or videos of the art that she finds intriguing. While many would urge having one goal and focusing solely on that, Melissa shows that this does not have to be the case. We can truly achieve anything we dream of, no matter how difficult or time-consuming it is--whether it is receiving a doctorate or becoming a world champion--it is possible, and it can all be done at the same time. PA: What initially attracted you to Muay Thai? MR: I took up Muay Thai by chance. After gaining weight during my first degree I wanted to shape up, and happened to notice a Thai Boxing class on a sports centre schedule so decided to try it out. Previously, I was not athletic. I had reluctantly participated in compulsory sports activities at school and in my late teens had taken some Kung Fu classes, but not trained to a competitive level. But with Muay Thai, from the first session I was hooked. In that first class, I felt a rush of endorphins I’d not experienced from sports before and discovered how satisfying it is to hit things. Later, I came to appreciate the cultural side of Muay Thai and the beauty in the various techniques. I trained in England for about five or six years, and gained some amateur and pro fight experience, before traveling to Thailand for what I expected would be a few-month stint. Ten years later, I still haven’t left! I retired from competition five years ago, but still usually train five days a week at my gym for the past nine years, Eminent Air Boxing Gym, and remain much involved in the sport. Why do I continue to do so? For me there is no other sport. I still love to train, still love to watch fights. Right now, I can’t imagine not wanting to keep it up. As a repeat world champion, what do you find that you learned about yourself through the sport? How much can be achieved through hard work and persistence. I don’t consider myself a natural athlete—sport was not something I excelled in. But I was extremely dedicated; I was usually first to start and last to finish a training session. It took some time to feel comfortable in a ring, but gradually my persistence paid off. You run the website Muay Thai on the Brain. What is your intention behind the site? I started the site in 2012 when I was injured with a torn posterior cruciate ligament and recovering back home in England. Back then, I was living at my parents’ house doing bits of temporary work and had a lot of free time on my hands. I guess I wanted to create something different from most Muay Thai sites. I wasn’t aiming to write fight reports as I’m not able to take high-quality photographs to support such pieces. I also wasn’t intending to write anything instructional. Although there are a number of sites focusing solely on women’s Muay Thai—and it’s great that there are such outlets to promote the female side of the sport—I didn’t want to exclude the men’s side. I also wrote a few non-Muay Thai-related pieces—whatever interested me at the time, really. But I regret that I’ve neglected the site for several months. So I suppose my intention is revive it at some point. You're incredibly educated, with a PhD in neuroscience. In what ways do you feel like your education helped you within the sport? I can’t think of any specific way it has helped me but education is important in general. I’m lucky in that I come from a developed country, and going to school and university was always part of my parents’ expectations for me. Many women around the world are not so privileged and, for them, gaining an education can bring opportunities and have a profound effect on their lives. From general observations in Thailand, I think it’s important for fighters to get an education so that they have options when their fight careers end. So many boxers in Thailand retire at a relatively young age, having not spent much time in school, and their options are then limited. You've been around the sport for many years. Have there been any, in your opinion, improvements? Any setbacks? How do you find the growing interest in MMA to play a factor in individuals learning Muay Thai? I think the main improvement is how accessible the sport has become. Now we are able to watch fights on live streams or within hours of the events on youtube channels such as Muay Ties and SMMTV. So many new gyms have opened up in recent years, catering for those who want to train for fitness purposes as well as fighters. I can’t think of any particular setbacks. I wasn’t involved in Muay Thai during the so-called “Golden Era”, so I don’t compare the current day sport to how it was back then, though I know people say modern-day fighters don’t fight as aggressively as their Golden Era counterparts. Many people also criticize gambling and the effects gamblers can have on judges’ scoring, but gambling is integral to Muay Thai (in Thailand anyway) and the sport wouldn’t be the same without it. In the women’s side of the sport, female fighters are still unable to fight at the main stadiums in Thailand (Lumpinee, Rajadamnern, Channel 7 etc), though in many other events they are among the headlining fighters on the cards. There are also fairly regular televised female-only events being organised, which are apparently doing well in the ratings. The one downside is that the promotion for some of such events can tend to be a bit beauty pageant-like. It would be nice if there was less focus on the female fighters’ appearances but that isn’t something that just happens in Muay Thai. MMA is something I take only a passing interest in. I do like that MMA has some female stars who have helped to promote female athletes in general. MMA has also brought people to Muay Thai as some famous MMA fighters have been seen training with Muay Thai instructors to develop their stand-up game. Also, fighters such as Joanna Jedrzejczyk, Valentina Schevchenko and Jo Calderwood have crossed over from Muay Thai and shown how effective Muay Thai weapons are in combat sports. What do you feel like has been your greatest accomplishment, in any aspect of your life? What is something you'd still like to achieve? For the feeling at the moment, winning the first belt (World Professional MuayThai Federation 126lb title on the Queen’s birthday at Sanam Luang in 2009) will take some beating. But gaining my PhD was also a huge accomplishment. Defending yourself against an opponent for five rounds in a ring is intimidating, but nothing compared to defending your research thesis for three hours in front of two examiners during a PhD viva! One thing I do miss about fighting is having regular and specific goals. Right now, there is nothing in particular that I’m striving to achieve. As far as dreams go, I would love, one day, to write a book. Whether it would be on Muay Thai or another subject I’m not yet sure, but Muay Thai would be a logical choice. What do you think sport does to empower women? What opportunities do you think can be gained for women, men, and the world at large by empowering women through sports? I developed a passion for a sport relatively late (in athlete years) and it changed the direction of my life. I was very shy when I was younger and never would have dreamt that I would have been able to get in a ring and fight in front of crowds of people and TV cameras. Muay Thai has given me some amazing opportunities, brought me to Thailand, and also enabled me to meet many interesting people from a wide range of countries and backgrounds. I believe all women should pursue some form of athletics, for health and confidence-building purposes. One of the best stories I’ve heard about sports empowering women was from my friend Niamh Griffin, who was working on this year’s IFMA World Youth Championships in Bangkok. She interviewed a 16-year-old Afghan female fighter for a feature called “Humans of IFMA” on the organization’s Facebook page. The girl explained that Afghanistan is not the safest of places for women to venture outside the home but, through Muay Thai, she has gained opportunities to travel overseas. She also described Muay Thai as something that brings people together, as well as the promise of success, and promotes peace. Her account provides the best demonstration that sport can go beyond giving an individual goals and motivation, to building unity within a team, and even having wider effects on peace in the community. All photos courtesy of Melissa Ray. Stay updated with Melissa and her Muay Thai musings by subscribing to her blog here!